Posted Jan. 17, 2019, 4:45 a.m.
Posted Nov. 8, 2016, 12:02 p.m.
Jacquarius "Jay" Quinn was a 17-year-old goofball who liked to hang out at home instead of the streets. But on Nov. 6, 2016, someone shot him in the head and left him to die on a desolate road in Palmdale. Two years later, family and investigators are still struggling to learn who and why. Los Angeles County Sheriff's investigators held a news conference Wednesday to announce a $15,000 reward for information leading to the arrest and conviction of those responsible for the shooting that left Jay lying alone in the street around 8:30 that night. The body in the southbound lane of the 2300 block of Old Harold Road didn't have any identification. Investigators initially thought he died from a hit-and-run accident, until an autopsy revealed he'd been shot in the head. Jay wasn't identified until the next morning, when his grandmother came into the sheriff''s department to report him missing and provided a description. Jay and his family had gone out to an early Sunday dinner and returned home shortly before 5 p.m., according to information released by sheriff's investigators. The last time family members saw him, he was lying on his bed around 5 p.m., looking at his phone. No one knew he left the house. 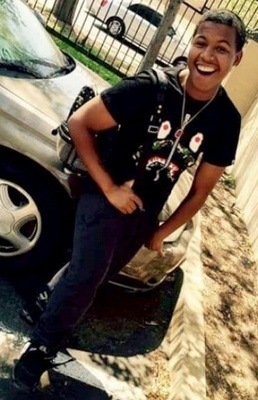 "He was just a kid, a good kid, a happy kid, who liked to cook and dance," his mother Jessica Quinn said during the news conference. "He was a clown. When he came in, the whole room brightened up. Holidays are not the same, nothing is the same anymore." Her voice broke, and Quinn took a moment to compose herself, wiping tears behind her large black sunglasses. "I mean, come on," she said finally, gesturing toward a large photo of Jay clowning for the camera. "He was an innocent child. He didn't deserve to die like that. He was just a kid." Jay's family would drive him to and from classes at R. Rex Parris High School, his cousin Donna Blackwell said. "He didn't hang out; he stayed home and played video games with his cousins, sister and brother," she said. "This was a kid who didn't know the streets. This was a kid who loved and was loved." Jay had a bushel of ambitions, said his grandmother, Paula Waller. Like Jay's mother, she wore a T-shirt emblazoned with Jay's grinning face, his tongue stuck out in childish exuberance. "He wanted to be a herpetologist because he loved snakes and lizards, and he wanted to be an actor too," Waller said. "He was a great kid, a wonderful kid, but maybe a little naive when it came to knowing how people can do betrayal." The family testimonials ended with Jay's 8-year-old brother, Jamelian. He stared out at the cameras and said, "Jay was my brother, the best brother you could ask for," and then ground his fists into his eyes trying to hold back his tears. His mother and grandmother gently stroked his back. "Jay was his world," Paula Waller said quietly. "He idolized his brother, who was taken away from him ... for no reason." The Los Angeles County Board of Supervisors is providing $10,000 of the reward money, and the rest is coming from the city. "Palmdale is a really nice growing city," said Mayor Steve Hofbauer, "and crime like this is something we're just not going to tolerate." Like everyone else, Hofbauer urged people to call investigators with any information they might have about Jay and his death. "Let's get this thing solved," he said. "We're all committed to seeing the killer and any accomplices brought to justice for Jay and his family." Anyone with information is asked to call Sgt. Guillermo Morales or Det. Steve Blagg at the sheriff's Homicide Bureau, (323) 890-5500. Those wishing to remain anonymous should call Crime Stoppers at (800) 222-8477. Photo: Jacquarius "Jay" Quinn clowning for a undated family photo provided by the Los Angeles County Sheriff's Department. Seems he might have snuck out and something unfortunate then happened. I hope the family gets answers. — Babs Jan. 17, 2019 at 1:46 p.m.